A menu will appear with the listing of all Districts installed on the current database server. Select from there. If yours is not listed, you should install your District through the established procedure (see there). 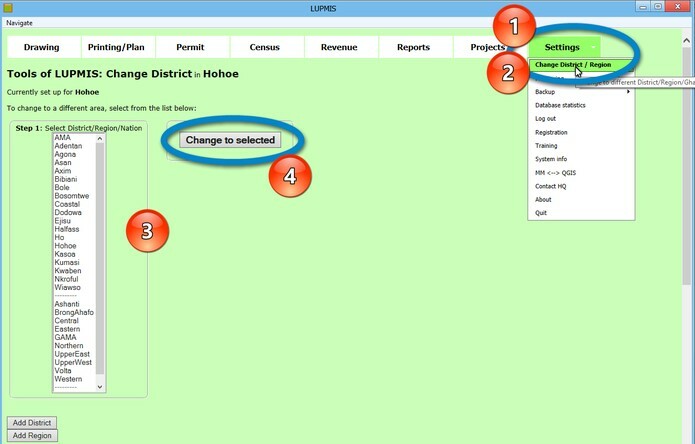 This will give you access to all District-specific databases, such as permits, revenues, addresses etc. If you don't know, in which District your system is in, use the option Settings Tools > About (see Chapter 8.9.7). If you set up a new District (or Region), you should follow a sequence of data population procedures: See Annex 9.1.